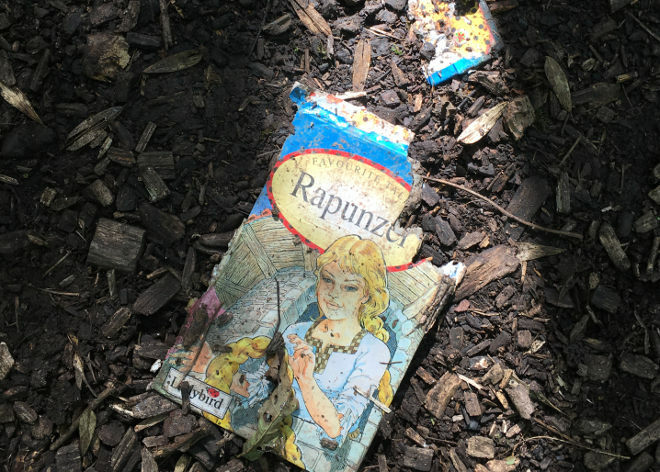 I spotted this torn and disfigured book cover on a shady cemetery path. It feels like an apt reminder of the darkness inherent in traditional fairytales. As a child the retellings of myths gathered or made up by the Brothers Grimm and Hans Christian Andersen frequently chilled me to my bones. Only in recent years have these twisted tales riddled through with warnings become saturated with the Happy Ever Afters we crave. Write something skin-shiveringly unsettling inspired by this image. If you write or create something prompted by this, please send an email to Judy(at)socket creative.com to let me know. With your permission, I’ll publish it on SkyLightRain.com.